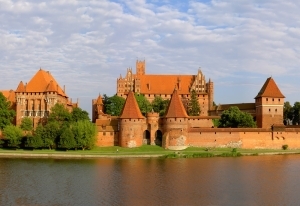 Majestic and beautiful, Malbork Castle has been standing on the right shore of the Nogat River for many centuries. 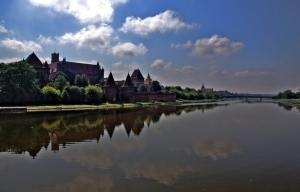 The city constructed around it took its name from this castle. 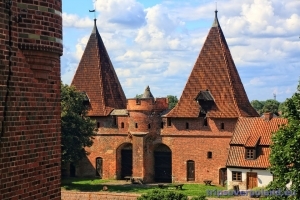 The monumental building with pointed towers and inaccessible walls has a proud title of the biggest brick castle in the world, it ranks among the biggest Gothic strongholds in Europe as well. 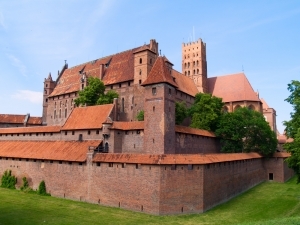 Another name, Marienburg, in honour of Virgin Mary, the patron of St Mary the Virgin Order, was given by the Teutonic knights who used this castle as their residence over several centuries. 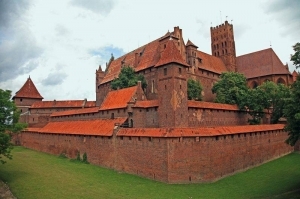 At the beginning of the 13th century Polish Duke Konrad of Masovia signed a set of contracts with the Teutonic Order, which resulted in constructing strongholds on Polish and Prussian lands that served both as defensive structures and monasteries. With fire and swords, the Teutonic knights – knights with a black cross on their white coats, introduced Christianity on the lands of neighbouring Pagan tribes. 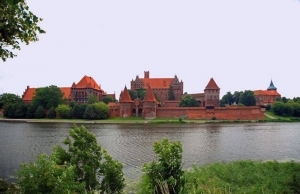 In 1274 in a valley of the biggest Polish River Vistula, on the shore of the Nogat River, the Teutonic knights started to build another stronghold which very quickly was to become the seat of the Grand Masters of the Teutonic Order and one of the most prominent castle complexes in the world. 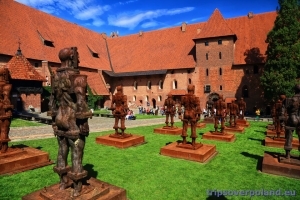 Every year Malbork Castle is visited by hundreds of thousands of tourists from all over the world and everybody finds something unusual and interesting in this extraordinary place. 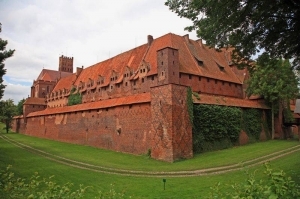 The rebuilt castle looks as if the time stopped and the powerful Teutonic Order still enjoyed its golden age. 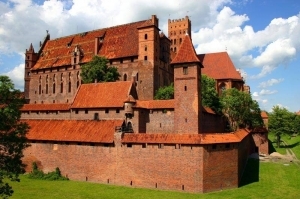 Malbork Castle was present on the sets of historical films many times over the last decades. Still, fans of costume reenactments can watch live medieval tournament reenactments and other performances during the International Festival of Ancient Culture which is held in the castle every year. 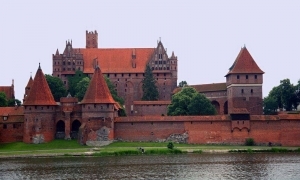 The reenactment of events of 1410, "the Siege of Malbork", is also organised on a grand scale. Before the eyes of astonished crowds of spectators, about a hundred mounted knights storm the huge castle fortifications, holding their lances, and another two hundred participants of this huge theatrical undertaking play roles of different medieval characters, from the Grand Master and beautiful princesses to squires and cooks. Besides battle and tournament reenactments, during this three-day holiday you can see many displays, traditional craft workshops, take part in shooting with a bow and arrow or listen to medieval ballads. 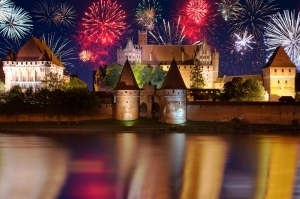 In the evening, during firework displays, the sky over the castle is lit up with lights of different colours and the huge walls sparkle with fabulous illumination lights provided by "the Light and Sound" display that ends every festival day. 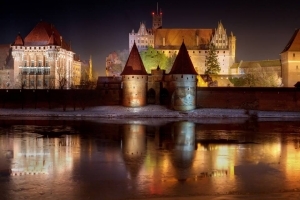 Tourists can wander along the streets of the old town that deserve no less attention than the castle itself. 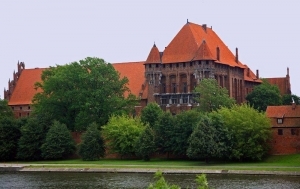 The castle museum, which collected a huge set of items over years, deserves special attention. 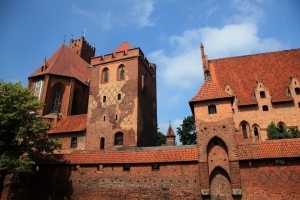 More than 40,000 exhibit items on numerous exhibitions in different places make that the museum is regarded as one of the biggest collections of medieval items in Europe. 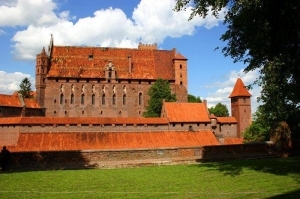 Masterpieces from the amber collection of Malbork Castle were exhibited in many museums abroad, including Germany, Sweden, the United Kingdom, the US, Japan, and Finland. Furthermore, the museum has a very rich numismatic collection as in its golden age the castle had its own mint striking coins for different rulers. 1 May - 30 September – from 09:00 a.m. to 7:00 p.m.
1 October - 30 April – from 10:00 a.m. to 3:00 p.m.